The MD-11 was the product of a cash strapped McDonnell Douglas attempting to upgrade its passably successful DC-10 and get a headstart on Boeing's 777 and upstart Airbuses' A330/340 in the next generation widebody stakes. The result was a disappointment both in terms of performance and sales. In addition the aircraft has gained itself a poor reputation for handling on landing, which has led to fairly regular 'incidents'. Nevertheless despite this the aircraft is quite beautiful and redeemed itself somewhat by proving its worth as a superior freighter. In fact you could argue the freighter version saved the type and certainly it was only due to this that Boeing kept the line open after it took over MDD and that production got to 200 units. In passenger service airlines like launch customer American Airlines were never satisfied with its failure to match performance guarantees. They sold their fleet after only 5 years and several other airlines kept DC-10s in their fleet longer than the replacement MD-11s! Other airlines, like Singapore, just cancelled their orders. In the end being a trijet at the dawn of ETOPs services would have proven insurmountable even without the performance problems but even so as of July 2016 there were still 123 of the 200 frames in service. Just as with its smaller brother the DC-10 the MD-11 had a whole host of upgrades added as production continued, with many of the changes being retrofitted to earlier build frames. All the detailed information can be found in David Hingtgen's awesome guide - Ultimate DC-10/MD-11 Guide. Suffice to say this review isn't going into this kind of detail especially as the model manufacturers almost never do themselves. The most obvious difference is the engine exhausts. In 1:400 the MD-11 has been well represented with 203 models to date. There are four separate moulds and few other types in 1:400 exhibit such a wide scale of mould sharing. This illustrates a) the changing relationships between manufacturers and b) the high quality of the existing moulds. To the right is the state of play at the moment. NOTE: I'm not going to review the Aero Le Plane mould. They only made 2 models, I know nothing about them, have never had the mould in hand and it doesn't look great anyway. Between 1998 and 2000 the model's had the original undetailed simple stalk style maingear, which looks poor and very dated. After 2000 however new maingear was added, which looks a lot better and has gear doors. The usual Dragon problems (simple undercarriage, clear tail join) are present but so are the usual Dragon strengths (no wing join seam, strong detailing on wings). Several other things stand out. Most noticeably that the two aerials above the fuselage at the wing are raised (see above in the Martinair shot) and the flap track fairings are very well shaped. For me the thing that lets the side down a bit is the nosegear. As you can see above in the real thing the gear leg should be pointing forward a bit. With Dragon's gear it doesn't and it is also a bit short. It's not the end of the world by far but it does sometimes make the nose look a little too long, which it isn't. Anyway it's a very good mould all round. This early Gemini mould has been widely used and is very good. It matches the Dragon Wings mould in terms of general shape and has a better middle engine fit. It does lack some of the finer detailing that the Dragon has and the underwing flap track fairings are a bit too round but these are minor points. Whereas the Dragon has raised antenna bumps this mould does not. There is also a wing join seam, albeit a small one and earlier models also have a second seam near the horizontal stabilisers (typical for several early Gemini moulds). This second seam is removed in later releases. 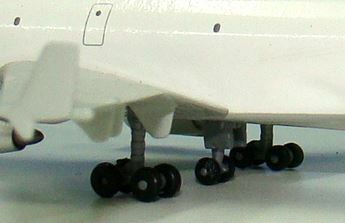 The biggest improvement over the Dragon mould is the undercarriage, especially the nosegear. It is longer and slants forward as it should. This does tend to make the model look better than the Dragon, at least to me. It says something for the quality of the MD-11 moulds available that sometimes it is hard to actually distinguish them from one another. I had actually thought this was a reuse of the Gemini mould until I did this review, but on close inspection there are a variety of differences and the mould in fact shares some characteristics with the Dragon mould. It shares the same wing seam with the Gemini but the detailing on the tail and wings is a lot stronger and the underwing flap track fairings are better shaped - similar to the Dragon. The stand hole underneath is also in a different position (round and further forward on the Gemini, oval and further back on the Phoenix). The Phoenix mould also, like the Dragon, reproduces the two antenna bumps just aft of the wing. The other main difference is the undercarriage. In detail they are quite dissimilar but the most obvious visual cue is the length of the maingear doors, which as in the real thing come down almost to the tyres. Lastly unlike both the other moulds the middle engine exhaust fairing is a one piece unit and not split into two. So in general the Phoenix mould is actually the best finished of the three moulds in their initial versions. In 2009 Gemini updated their original mould with rolling gear. Not only do the gear roll but the gear legs are much more detailed than before. The result is an improvement to the mould. As Gemini Jets are nowadays made by JC Wings in their factory JC have also begun to use the mould and further updated it in 2014 by adding aerials. These changes make this the best mould so far for an MD-11 imho. As with Gemini Phoenix too have updated their mould with rolling gear, however it hasn't been as successful. As is often the case with Phoenix although the gear hubs are really well detailed the tyres are too big. The gear legs are also quite chunky and too long giving the aircraft a bit of a nose up appearance. It's not a disaster (like their 757 change) but it's not as good as Gemini/JC Wings effort.